The fifth-wheel coupling connects the trailer of a semitrailer with the towing vehicle with a secure but rotatable connection. When the towing vehicle is moving in reverse, the kingpin of the trailer is pushed into the coupling. A locking mechanism locks the fifth-wheel coupling automatically. It is now in travelling position. A breech wedge secures the kingpin. To uncouple, the locking mechanism is released with a hand lever. During the release action, the locking mechanism parts move into retraction position. The towing vehicle is uncoupled from the trailer. The fifth-wheel coupling is subjected to impacts, vibrations, dirt and moisture during travel. 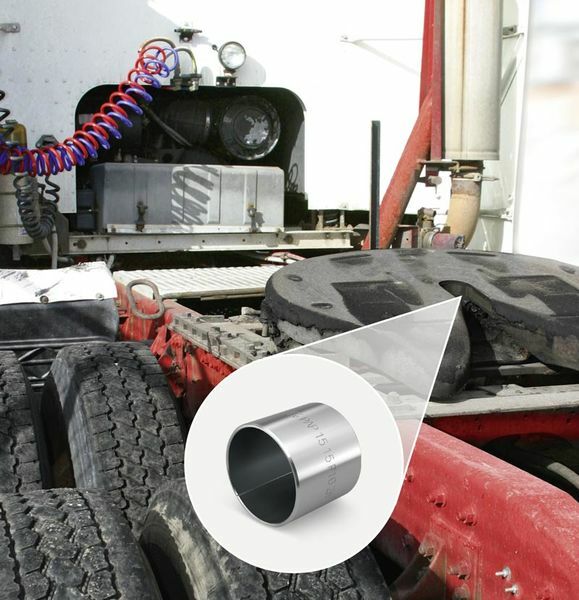 For the bearing in the fifthwheel coupling, plain bearings must be robust and highly stressable and work smoothly even if the fifth-wheel coupling is not used frequently. For the bearing, KS PERMAGLIDE® P10 plain bearing bushes are pressed into the locking mechanism parts. The KS PERMAGLIDE® plain bearings work reliably and smoothly even under difficult operating conditions over the entire service life. The plain bearings are protected from corrosion and are subjected to extremely low levels of wear. The axes are made from steel – using KS PERMAGLIDE® plain bearing bushes means that no tribocorrosion occurs. In damp environments in particular, this sliding layer system provides outstanding protection against corrosion. Moreover, lead and PTFE have an extremely low absorption tendency. Absorption of the surrounding luids, swelling of the materials and chemical damage to interacting sliding partners are prevented. The result is dimensional stability and optimum corrosion protection during use.